Today's Hallowe'en Countdown continues with predictions about the future that eerily come true. Out of all the future predictions made by authors in novels from the 1940s to the 1970s, only one author was nearly perfect in his accuracy: George Orwell. He based his dystopian future in the novel Nineteen Eighty-Four on his experiences fighting in the Spanish Civil War, where he saw history twisted and rewritten in the name of power and politics, with no reference to reality. For Orwell, the moment we could no longer recognize the difference between reality and a virtual world crafted by media hype or special interest rhetoric was the moment when fascism would arrive in free societies. In his view, one of the cardinal signs of that arrival was the implementation of a universal surveillance system, with two-way screens in all private rooms and on every street corner (Orwell did not anticipate that people would happily carry their Big Brother screens around with them in the form of the iPhone 5). The only thing that Orwell predicted that has not (yet) come to pass is a state-enforced mindless acceptance of Big Brother culture, along with the establishment of unrecognizable Thought Police, the prosecution of Thought Criminals and evil children who spot those disposed toward Thought Crime. Nor has a shadow leader emerged to pen a counter-manifesto against the régime. On the other hand, plenty of Winston Smiths on the Internet would dispute that. The Web's conspiracy theorists are convinced that a system akin to what Orwell fictionalized already exists. Then again, that would bring us full circle to the issue of not being to distinguish between reality and unreality. Ironically, rampant Millennial rumours about an impending Illuminati New World Order create a grand online fantasy, which leaves its believers vulnerable to the very real fascist turn that Orwell predicted. In other words, Orwell's biggest warning sign is here, and it is not the real threat of Illuminati overlords. 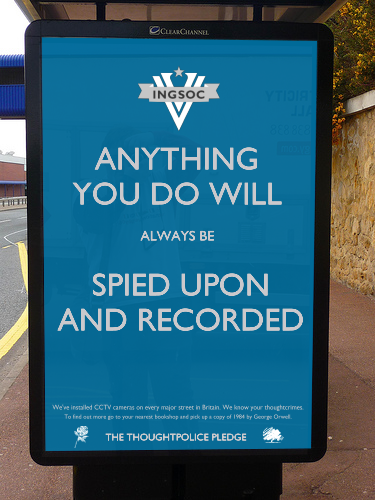 The most frightening sign that Orwell's future is here is the real popular belief in imaginary secret cabals. The moment when the paranoid masses cannot distinguish between fiction masquerading as fact and actual fact is the most frightening moment of all.